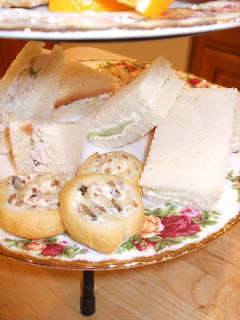 The Friday after Thanksgiving, is our annual Holiday Tea. 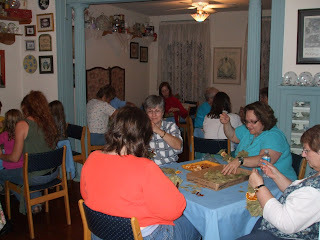 There is much preparation involved in getting this organized - from menu planning to decorating to enjoying Thanksgiving dinner with family... it can be a bit hectic (so much so that I forgot to take any pictures on the day of the tea alas). This special event is one that has become a tradition for many of my guests. 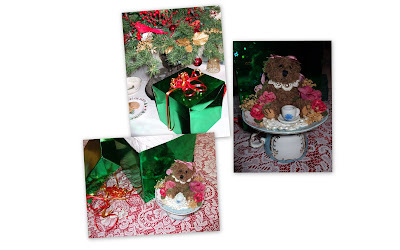 This year, I was surprised with a beautiful shiny green box - a present that featured an adorable teddy bear perched upon a tea cup, enjoying tea. The mother and daughter that presented the gift to me told me they just felt it belonged in a tea room! How thoughtful is that! Teddy will indeed find a special spot in the tea room, and every glimpse of him will remind me how thankful I am for tea room customers that have become good friends. Father in heaven, we thank Thee! 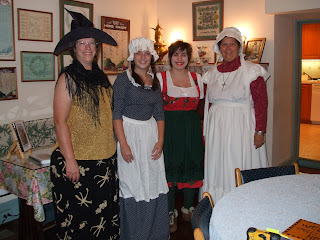 These fun collections belong to Marj, our Jim Thorpe sister. An artist all her life, she creates vignettes throughout her home that inspire you to stop and observe, to admire and wish to recreate. 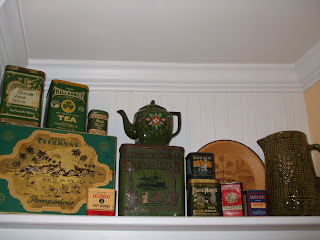 In her recently remodeled kitchen, she had very narrow shelves built in above each doorway providing a perfect location for a visual display of her fun collections. 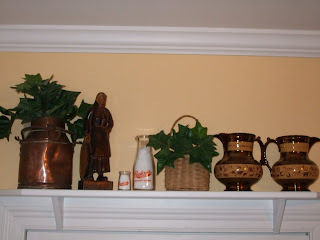 The matching pitchers are remembrances from our Mother's collection of luster ware. The wooden statue is a figure that I brought back from Spain well over 30 years ago. It makes me happy to see it has a very special spot in her kitchen collections. The little milk bottles are from Peplau's dairy. Mom's maiden name was Peplau, no connection to the dairy though. As part of our year long 40th Anniversary celebrations, we held a Founder's Day Tea and honored our parents, Bertha and Byron Reppert. It was a joyful gathering of family and friends, a day of remembering and sharing as we talked about the early days of Rosemary House. 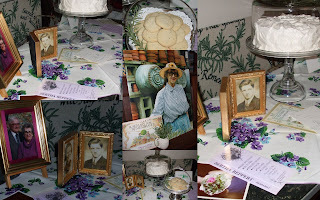 A full Afternoon Tea was served and ended with Lane Cake and Rosemary for Remembrance cookies. We have been serving delicious Mushroom Bacon Pinwheels at several of our Afternoon Tea events, and they have received rave reviews, so I thought I'd share the recipe with you. Not only are they yummy, but they are fast and easy to prepare. You can make them a few hours before serving, and then bake them just before serving. Enjoy! Blend cream cheese, mayonnaise, bacon bits, mushroom pieces and garlic powder until well mixed. Separate crescent dough into four rectangles; seal perforations. Divide cream cheese mixture evenly between all 4 rectangles and spread to within 1/4 in. of edges. Roll up jelly-roll style, starting with the short side. Cut each into 5 or 6 pieces. Place slices cut side down on parchment lined baking sheet. Bake at 375 degrees for 12 minutes, until golden brown. Serve warm. Yield: 20 - 24 pinwheels. These little tea party bears simply make me smile! Purchased in a tea room gift shop many years ago, they have made their home in my tea room bath room! Simple to recreate with a hot glue gun and the right components, perhaps it's an inspirational idea for you to make at home. The hardest part might be to find a flat backed basket; but once you have that, I would imagine you're on your way. Bears, lace, and a fancy bow, coupled with a miniature tea set completes the tea party bears. A bit of love from someone near. Best wishes for the coming year. 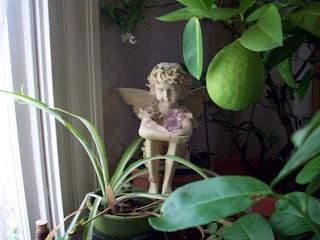 . ."
It is the time of year to bring houseplants inside to keep them warm over the winter. This large window creates a cozy reading nook for us to sit, rock and read. We believe "back door guests are best" and it is a good thing too since this is our foyer, and the front door is barely accessible! These girls nestled themselves in amongst the greenery. We have the largest citrus grove in Mechanicsburg. Five large citrus trees come in - 1 lemon, 1 lime, 1 grapefruit and 2 orange varieties. The oranges have very fragrant blossoms on them now and I was very fortunate that this grapefruit did not fall off when the tree was jostled inside. In another month I will enjoy a home grown grapefruit treat! With all the citrus trees, I like to close my eyes and pretend it is my own orangery, a large greenhouse designed to overwinter fruit trees popular in the 17th - 19th centuries. You might be familiar with large ones such as what is featured at Kew gardens in England, but wealthy Victorian gardeners would have some enclosures on their homes as well. 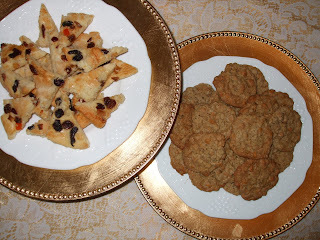 Pat Hartman of Your Tea Life, and former owner of Civil-la-Tea, a closed tea room once located in Gettysburg has graciously agreed to allow me to post her recipe for Cinnamon Chip Scones. 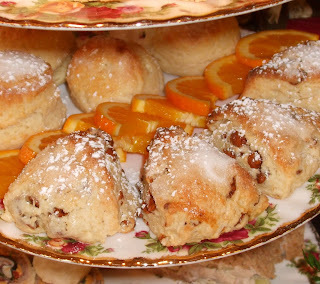 Now that fall has arrived, I particularly enjoy serving these scones. Pat has published two cookbooks, Teatime in Gettysburg and Lunchtime in Gettysburg that are available from Your Tea Life, her online shop. They are both great cookbooks! I've enjoyed making and serving many of her recipes in Sweet Remembrances. In a large bowl, mix together flour, sugar, baking powder, salt and nutmeg. Cut butter into dry ingredients with a pastry blender until mixture reaches a crumbly consistency resembling coarse oatmeal. Mix in cinnamon chips. In a separate smaller bowl, whisk together heavy cream, egg, and vanilla. 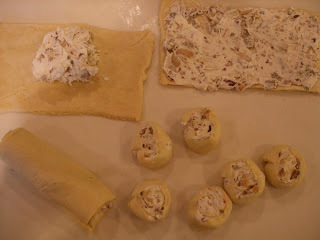 Add to dry ingredients and mix thoroughly, being careful not to overwork the dough. On a floured surface, shape dough into a circle about eight inches in diameter. Cut circle into eight equal wedges. Place on a baking sheet either separated or left in a circle. Bake 18 - 20 minutes at 350 degrees until tops are lightly brown and a toothpick inserted in the center comes out clean. Note: When I prepare these, I divide the dough in half, form two balls, and cut each ball into 6 triangles. Bake for 13 - 15 min at 425 degrees. Thanks Pat for sharing this great recipe! 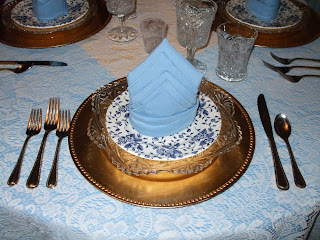 Chef Henry Haller, who served for two decades in the White House from Lyndon Johnson thru Ronald Reagan, devised this unique way of presenting appetizers. At cocktail parties and receptions, the simulated cake was quite a conversation piece and breathtaking to behold. 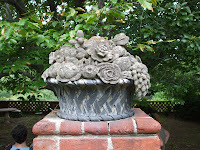 The base is a styrofoam circle 8 to 10 inches in diameter and shaped like a 2-layer cake, about 6 inches high. 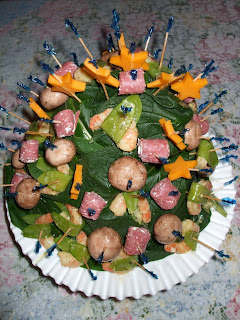 The "cake" is draped with non poisonous leaves. Chef Haller was partial to galax leaves which are thick and sturdy. On the one pictured here Nancy has used our comfrey leaves from the garden. A variety of bite sized canapes are then attached with decorative toothpicks resulting in the edible visual delight. 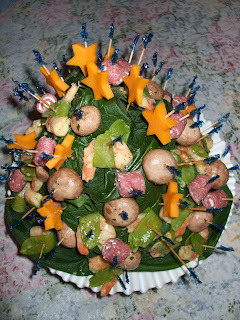 Any number of cold canapes can be used to create the "cake" as long as all the choices are bite size and can be readily fastened with toothpicks (a canape is any appetizer that can be eaten out of hand and without the use of a fork and spoon, thus leaving one hand free for holding a cocktail). Chef Haller usually created the "cake" with around 300 canapes, to serve 50 to 150 people. On the one that Culinary Artist Nancy Reppert created for our Road to the White House dinner, she featured cheese stars, shrimp wrapped in snow peas, marinated mushrooms, and beef rolls filled with horseradish and cream cheese. One of our recent fall classes was to create this clever Bay Leaf Wreath. 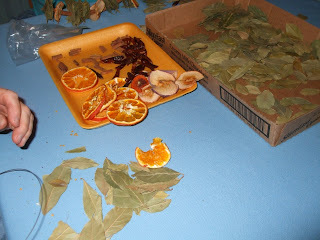 We used all organic bay leaves, dried apple slices, dried orange peel, organic chili peppers and cinnamon sticks also. The wreath can be hung in your kitchen and when you need a bay leaf or two - there it is! All the busy hands simply thread the fruit, bay leaves, and cinnamon sticks onto a 16 gauge wire. It is such a simple and fool proof craft we even had a mom and her kids working on a wreath. When you have filled up your piece of wire, loop the two ends together and tie on a raffia bow to hide the loops. It's fast, festive, and fun! Simple too! Enjoy! Bright baby eyes, and little button nose. We're excited to announce the arrival of the newest addition to our growing family. 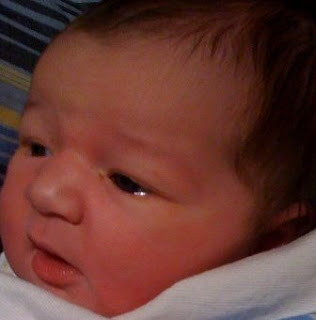 . . . . the second Great Grand-daughter for the Patriarch of our family. the end of the campaigning and a new beginning! The table is set, and the menu is prepared. Tonight's special dinner, featuring recipes from White House Chefs, is prepared once every four years - not to be repeated again until 2012. Please remember to vote today! In the past four presidential elections, Family Circle magazine has held a bake-off featuring a favorite cookie recipe (not necessarily an original recipe) submitted by the candidates wives. We've been serving and enjoying the cookies submitted by this years 'hopeful' First Lady. The cookies on the left are Michele Obama's shortbread cookie and the ones on the right are Cindy McCain's Oatmeal-Butterscotch. The results are in, and Cindy McCain's cookie recipe has won the popular vote 54% to 44% as shared in the Nov. 1 issue of Family Circle magazine. 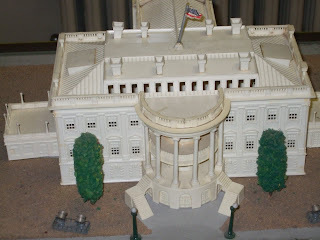 In past years, the winner of the bake-off has also won the White House. Wonder if they've calculated the electoral votes? We used this 'book' to offer the chocolate covered garlic at the end of our Garlic Dinner. 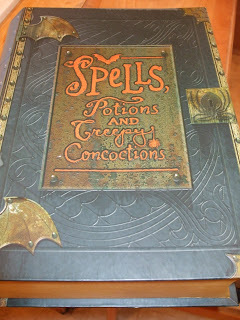 Each time you open the cover, there is a unique comment in a witchy voice, with about 6 different phrases. 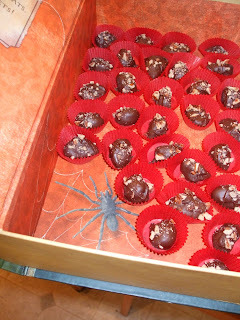 We had fun opening and closing this book, offering Chocolate Covered Garlic to all those that dare. Thanks Marj, our Jim Thorpe sister, for sharing this book with us! Peel and separate 20 cloves of garlic. Place garlic cloves in a small pan of water and boil until tender, about 6 minutes. Drain garlic, pat dry, and set aside. Melt 1 cup semi-sweet chocolate in microwave. Add 1 tsp. shortening to melted chocolate. Stir well. Dip each garlic clove in melted chocolate, place on wax paper. Sprinkle with chopped pecans. Refrigerate until firm. Place in candy cups, and enjoy! Note: For true Garlic die-hard fans and a real 'garlic bite', do not boil the garlic cloves. and we dressed for the occasion.